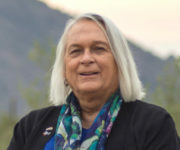 Posted on August 23, 2016 by Ellie B.
Ginny Dickey is running as a write-in candidate for mayor of Fountain Hills, a town of about 22,000 people in Maricopa County, east of Scottsdale and bordering the Fort McDowell Yavapai Nation. Ms. Dickey, one of five siblings who grew up in New York’s Hudson Valley, moved to Fountain Hills in 1983, following her parents, who relocated in the late 1970s. She holds a bachelor’s degree in mathematics from Tufts University. Ms. Dickey jumped into the race challenging Mayor Linda M. Kavanagh for several reasons, including that Mayor Kavanagh would be running unopposed for the third time. The Fountain Hills mayoral election will be decided on August 30 — not in November. “There was a definite discontent overall that the mayor would once again be unopposed,” Ms. Dickey told us in an email. “We opened a $500 threshold campaign committee on June 28 so we could do a poll, which came back that we could possibly be successful, so we opened up the full campaign committee on July 11,” 10 days before the write-in deadline. “The reaction was very encouraging and positive. No matter the result, this has been such a joy and privilege to offer up a choice,” wrote Ms. Dickey. Much of her time is spent “making sure people know I am a candidate, then on how to actually vote for me,” Ms. Dickey wrote. “The legislative mandate that cities must hold elections in the fall of even years has disenfranchised Independent voters and turned our local elections into partisan affairs.